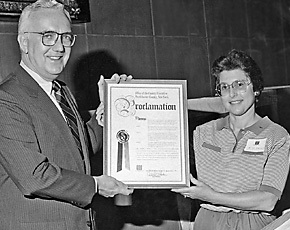 White Plains has existed as a city for 90 years, and Rita Malmud, the city's Common Council president, has been a resident for almost half that time. She arrived in the city in August 1963, soon after marrying Thomas Malmud. The couple moved into an apartment building on Grand Street near Quarropas Street—across the street from the old library and the still-existing giant-size copper beech tree—that was later torn down during urban renewal. They employed the "late relative, early Salvation Army" style of design, Malmud said, and at first could only afford to furnish their porch. The Malmuds moved to the Gedney neighborhood in 1966 ("we took every little penny we had and invested in this house") and raised two children: Paul is living in Virginia with his wife and two children, where he runs a new media business with his wife, and Joan, an avid traveler, is unmarried and living in Oregon, where she teaches legal writing at the University of Oregon Law School. Malmud said her daughter probably inherited her travel gene from Malmud's father, who moved his family around the country throughout Malmud's childhood. The family left Santa Barbara, Calif., where Malmud was born, when she was two years old, and lived in Macon, Ga., and later in Atlanta; in Speedway, Ind., and later in Indianapolis; in Tulsa, Okla.; and in Houston. 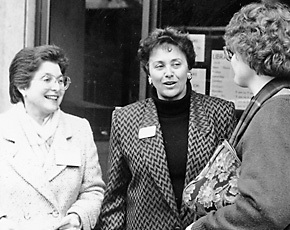 Before being elected to the Common Council in 1989 (she began her first term in January 1990), Malmud was president of the Westchester County League of Women Voters, and prior to that she was president of the White Plains League. 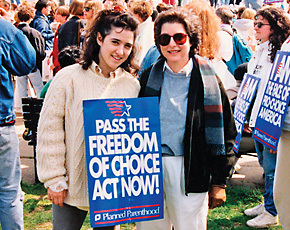 Malmud said she was "not particularly interested" in politics and government when she first came to White Plains, but after receiving a flyer from the White Plains LOWV describing their local program and advertising a new study of the local environment, she became involved, "and before I knew it, I was chairing the study." She became voter service director around 1976 before going on to become president. When her last presidential term at the Westchester LOWV ended, she was asked to run for Common Council as a Democratic candidate (she had always been an Independent). "I gave the suggestion long and hard thought," Malmud said. "I finally decided that if I cared so much about community issues, the best way to effect change was to be part of the group that made decisions for my community: the Common Council." Malmud recalled that when she informed her mother of her intention to run for political office, her mother gasped "but you're so nice!" "I very much appreciated her loving summation of her nice daughter, but I responded that if 'nice' people didn't get involved in their government, then government and communities would be less likely to improve for the better." How did her husband feel about his wife entering local politics? "My husband has always been my number-one supportive fan," Malmud said. She said she believes he derives "vicarious satisfaction to see I'm doing the kind of thing he feels he doesn't have time for." Thomas Malmud is a real estate and corporate attorney at a New York City law firm. Malmud's favorite pastimes include cross-country skiing, swimming, walking, and hiking. She's also an "enthusiastic charter member" of The Book Babes, a book club whose current book under discussion is "The Lost Painting: The Quest for a Caravaggio Masterpiece" by Jonathan Harr, a nonfiction book about the discovery of a previously unknown Caravaggio painting that "reads like a mystery," Malmud said. Since her husband is an ardent New York Jets fan, Malmud has been to "a zillion" Jets games since the Joe Namath days, and "only a million" New York Mets games. The Malmuds also attend many jazz concerts, theatre events, and the New York City ballet. 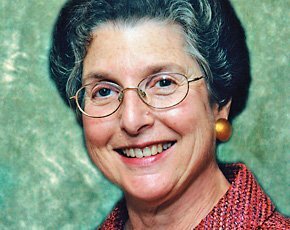 Malmud holds a bachelor's degree from Sarah Lawrence College, where she was a four-year scholarship student, and worked with large commercial computer systems during the dawn of the Information Age in the mid-1960s. From 1973 to 1981, she was vice president of Malmud Realty, a family-owned business, and later in the 1980s she was a partner in Houseovers, which would buy, renovate, and resell homes, mostly in the Rye/Port Chester area. Malmud said that each council member and mayor she's worked with has taught her something different: "pitfalls to avoid and styles to emulate." 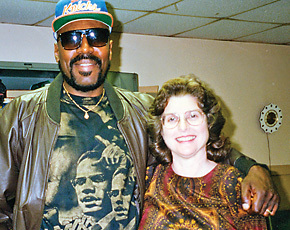 She expressed great admiration for Robert Greer, a fellow Democratic councilmember who was diagnosed with amyotrophic lateral sclerosis—also known as Lou Gehrig's disease—in January 2005 but who has continued to serve on the council despite a progressively worsening condition (as is always the case with ALS) that confines him to a wheelchair. "I am overwhelmed at Bob's ability to handle his devastating illness with the courage, class, and determination he has shown," Malmud said. "His business and planning background gave him special knowledge and expertise that the rest of the council benefited from, and over the years Bob was most energetic with meeting as many of his constituents and civic groups as would invite him. He has been a tireless advocate for the homeless and those seeking basic shelter with only less-than-modest means." Greer was vice president of finance and strategic planning for MBIA Insurance Corp. before retiring in 1999. Malmud also spends much of her time meeting with residents and civic groups. 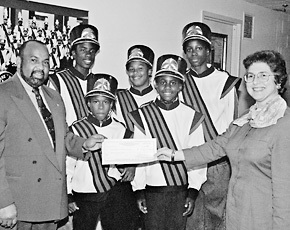 She is pictured here with the Slater Center Drum Corps. Though she said there is no typical workday for her—something she likes about the job—she spends many evenings attending meetings with the city's various civic and neighborhood associations. "As valuable as the information I get from city staff is, there's nothing to replace the information I get from city residents," Malmud said. She also spends lots of time on the phone, and since the 1990s, she, like most of us, has spent progressively more and more time with email correspondence. 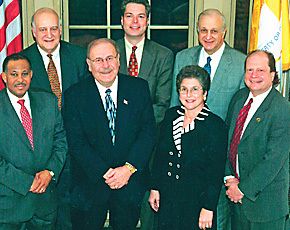 Malmud is currently in her third term as Common Council president. While council member terms are four years, the Council president serves for two years, and is elected by the other Council members and the mayor. When asked about her toughest times on the Council, Malmud said this would be "any time there is a significant divide within the White Plains community." She cited as an example the WestHelp issue and general debate on the homeless that took place in the early-to-mid 1990s. She said that with an issue like WestHelp, there are "rational reasons" on both sides that people have for their point of view. With WestHelp, the issue was not whether or not to help the homeless, Malmud said; it was how to help them, when, and where. "We spent enormous numbers of hours on that issue," Malmud recalled. "Even today, we don't call it WestHelp, but the need is still there." Malmud said that she tries to bring civility and respect for differing opinions to her service on the Council. "You can disagree without being disagreeable," Malmud said. "You can always legislate effectively with grace and dignity. You can attract more support with a well-reasoned and considerate speech than with tactics of intimidation, insult, or selfish political motivation." But lest you think she's being "Pollyannish," Malmud said, she recognized early in her political career the importance of "the iron fist in the velvet glove: treat all who disagree with you with courtesy, but be prepared to stand and fight with iron determination for those important votes." One of Malmud's biggest regrets during her time on the Council involved a vote on a settlement for a lawsuit brought by a person who had hopped over a metal barrier in a city-owned garage. The barrier was not defective in any way, and there were no other dangerous conditions present, Malmud said, but the person was injured when they tried to scale the approximately two-foot barrier. Malmud thought the damages being sought were too large, but ultimately gave in and approved the settlement. "I wonder to this day, if I had stood my ground, would any other councilmember, perhaps even a majority, been heartened to join my initial dissent? Even though it is good business judgment to throw a 'small' amount of money at a problem to make it go away, this seemed too flagrant an example of someone abusing the city." Does Malmud hold any other political aspirations? Perhaps to be White Plains' first female mayor? While stressing that since she just began her current four-year term in January (her fifth), it's much too early to be thinking ahead to 2009, she admitted that "my 17 years on the Common Council have certainly given me the expertise and credentials for seriously considering the mayoralty." Mayor Malmud? It does have a nice ring.